I really meant get out your calculators. But I loved that movie. Anyway, thanks for following along. I've been slow because I've been knitting. And I twisted my foot which hurt a whole lot and I felt sorry for myself, but it's better now. Just a little purple and swollen, but I can walk. 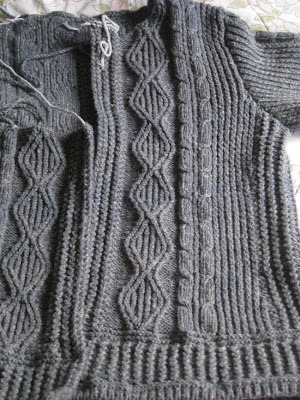 OK, back to Tweedy Aran Cardigan. One person reported trouble seeing the numbers on the schematic I posted. Sorry for the trouble. I was having photoeditting, blogger, and html trouble. Clicking on the photo in that last post will take you to flickr. Then, right above the photo you will see a mini magnifying glass and the words "all sizes". Click on that to see the schematic really big. Let's see what I can make work now though. So first look at the numbers of the schematic along the bottom of the back. Are they exactly one half the bust circumference? Mostly, yes, except not in the largest size. 25.25 times two is only 50.5. If that inch matters, then you will want to know if the error comes in the schematic or in the stated size. Two issues. First, there's the math sloppiness. In order to know the true largest size, one would need to do some calculations. Second. Where's the selvedge? I have seen way too many patterns that do not account for the selvedge stitches. Let me give an example. Suppose the gauge is 4 stitches to an inch and it is a pullover knit in two pieces. Design says finished sweater will be 36 inches at bust. So they say knit each of back and front to be 18 inches across, or 4x18 = 72 stitches. However, once you sew the two pieces together, you lose four stitches to the seam. That's a whole inch. The finished sweater really measures 35 inches. 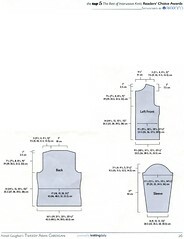 I've seen this in patterns for bulky weight as well, with the gauges of 2.5 or 3 stitches per inch. And I am not just talking freebies from random folks on ravelry, these are professional designers, both in magazines and self-published. I've browsed ravelry project pages of some of these and sure enough, for a decent percent of finished sweaters, the knitter mentions that it is smaller than anticipated. Pay attention. If you want to knit a sweater and a number of folks complain about the fit, check the numbers yourself. There's a decent chance the selvedge stitches weren't accounted for. We do not know in this pattern whether the designer accounted for selvedge but just doesn't show us on the schematic, or if the design does not account for selvedge and thus will knit up too small. We'd have to calculate that ourselves. Now, one of the best parts of this pattern is the waist shaping. Sadly enough, the IK stylists and editors from 2001 did not even photograph this aspect of the sweater! Fortunately we have ravelry and can browse the FOs to appreciate this detail. So, you choose a size, but how much of a waist shaping will you get? Check out the schematic. My stars. If you make the smallest size, the waist shaping is in reverse, girth there will be bigger than at bust. The next size up, 38 inches, will give a waist decrease of two inches total, since the back indents by one inch. But then holy mother of saints! The largest size, with the 51.5 inch bust. According to the schematic, the waist shaping is NINE inches. Yup, that would mean a waist circumference of 42 inches. That is quite the hourglass figure, yes? OK, so all this tells you is that the schematic figures are completely wrong. If you want to know how much waist shaping you will get you have to figure that out yourself. We'll leave that for next time. Now I want to finish my sweater. See. I've knit the body as a unit and all I have left is to finish one front and then knit the collar. the second sleeve is already knit and ready to be sewn on. Knitting math. Or how to think for oneself. Or, you don't really need circulation in your arm anyway, do you? Frankly, I should be knitting out in the sunshine instead of doing this. But it just keeps bugging me. I thought about posting it on ravelry, but there's too much "only say nice things" etiquette there. I thought about posting a review on the Interweave Knits storefront for the pattern, but I'd have to create an account and it seemed like a hassle. I ought to do that anyway though, I would LOVE to know if IK would allow such candid comments in their review. Source: Interweave Knits 2001 and then in a special limited release free e-book and now available for purchase at Interweave Knits. Pros. This is a really cute cardigan with nice attention to detail. The waist shaping in particular makes for a professional look. A combination of twisted rib, "fancy" rib (a rib created with alternating left and right twists, like mini-cables) and some elegant and simple cable motifs. Cons: Unfortunately, you will not know it's cute or that neat shaping from Interweave. The only photos are of a size 42.5 sweater on a model with perhaps a 32 inch bust and stick arms. She's probably petite as well, as the sleeves are way too long. There are no photos of the back or the sides that would show the nice waist shaping detail. Ravelry is your friend here. Lots of very well fitting sweaters AND photos of the details. There are three problems with this pattern. The first seems well known (from browsing ravelry projects) although not listed officially anywhere. The waist shaping decreases 5 stitches from each side of the back (and five from each front), all in the twisted rib section. This is a crucial design element. However, in the 33.5 inch size, there are only Three stitches of twisted rib on each end. If you follow directions, you end up cannibalizing the cable. Oops. Following the directions will result in the elongated cable lying right next to a column of twisted knit stitches. This is wrong. One really ought to have at least one column of purl stitches next to the cable. I put one column in (by starting and ending the twisted rib with a purl instead of a knit), and now that I am about half done the body, I wish I had put two columns. If you look Very Carefully at the original photo, it sure looks like there's a purl column there where it should be. Now here's an issue I haven't seen noted elsewhere. (Although, several knitters on ravelry did have trouble getting their sleeves to fit, and some reknit or added a gusset.) The sleeves are pretty narrow, and get more narrow as a percentage of bust size as one goes to larger sizes. 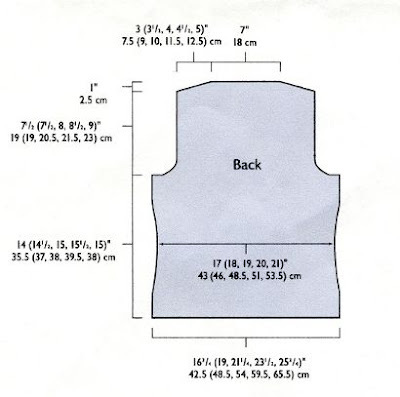 The 33.5 size sweater has sleeve size (measured around upper arm) off 38% of bust, or 12.75 inches. The 51.5 size sweater has a sleeve size of only 30% of bust, or 15.5 inches. For a cardigan designed to be worn with a shirt underneath, with some positive ease, these numbers don't make a lot of sense. For numbers that make even less sense, look at the schematic (you can click and make it bigger). This is from the ebook edition and matches the original magazine version exactly. (The ebook did correct and errata in the cable instructions.) For anyone who likes math and likes being appalled at arithmetic errors, enjoy. I just have to say WTF? Either Norah or some tech editor at Interweave is either pretty stupid or is making a nasty comment about their audience. Knitting question. Rant to follow shortly. IF anyone who knits happens to stop by, would you mind answering a question? Do you knit sweaters or garments or anything from published designs where size might be an issue? Do you care if the design has schematics? Do you check the schematics? One of your investors is not happy. Moreover, he is completely flummoxed why another investor (Bain?) is happy and willing to give more money to you. So this VC guy is appalled at your business model. Says "Bill Nguyen is always on vacation and the CEO just looks confused." And if this information isn't for public announcement. Well then, Rich, don't scream it into your iphone in public, ok? One would think that having a new kindle2 and going to a book group would mean a show-and-tell. Alas, not the case. I had brought my kindle, in its gorgeous ultrasuede cover, but it stayed in my purse. We even talked about kindles. Someone brought them up, someone else mentioned a Seattle Times article than "panned them." The career bookseller was pleased to hear that. (It didn't, not really.) Her livelihood is at stake. But most people had never seen a kindle and no one had seen a kindle 2. One person mentioned that a little wistful. But I was too chicken to get controversial. Little did they know they were about four feet away from one. The negative things they said about the kindle? Most of them weren't true. Face it. Kindle or its competitors will change bookselling. And in some ways, it's about time. Sorry about that, but times change. There will still be a market for bricks and mortar bookstores, for real live booksellers, at least in the near future, but the times are changing. Like holding a book in your hands? Well, actually I don't. I find my hands hurt after too long holding a book open. And some books are heavy and awkward to hold. A kindle is like getting ergonomic bars on your bicycle. All of a sudden, many other hand positions are available and no more cramping. Multi-tasking. I like to knit, but that cuts into my reading time. I thought audiobooks would be the thing, but they aren't always appropriate. I can read a children's chapter book (big print) and knit, as long as the spine is already broken on the book. With the kindle, my reading while knitting options open up wide. No backlight? I love the fact that it doesn't have a light! It's easy on the eyes, easy on the power consumption, all around a win. I am fine with greyscale. Color is over rated. Weight of books. Several people mention being able to take lots of books on vacation, not running out if the plane is delayed. I also see this as the future of textbooks. My teen's backpack is lethal. There's no reason he should be carrying around all that weight all day. (sure there are lockers, but not enough for everyone and not enough time between bells to utilize it anyway.) Just think if all or most all textbooks were e-books. A savings all round. Formatting pdfs and blogs and newspapers. So it's a work in progress. I downloaded the free sample first chapter of my graduate school Algebra text to see how it handled the symbols and it was fine. I haven't tried a knitting pattern yet. I expect some will be frustrating, some might be fine. Not being able to share or resell books? I suspect that's a work in progress as well. Carbon footprint? Saving paper, of course, but it does cost resources to make the e-reader. Saving trucking costs getting books to stores. Just thinking textbooks alone: My son carries at least 10 pounds of textbooks every day. So, 10 pounds by one million kids by 5 mile average round trip commute is using fossil fuels to carry 50 million pound-miles every school day. Account for absences etc and say 150 days a year. How much gas does it take to move 3.75 million tons of weight a year? (note, my numbers are very back-of-envelope.) I know laptops were supposed to be the end of carrying heavy backpacks, but that hasn't happened. I like that the e-reader has limited net access. I don't want a full bells and whistles browser, because I don't want the distraction and temptation. It's not going to happen tomorrow, but it will happen. And sooner than some suspect. Now I just have to get up enough nerve to admit my purchase to diehard book fans. I'll think about that tomorrow. Tomorrow is another day.